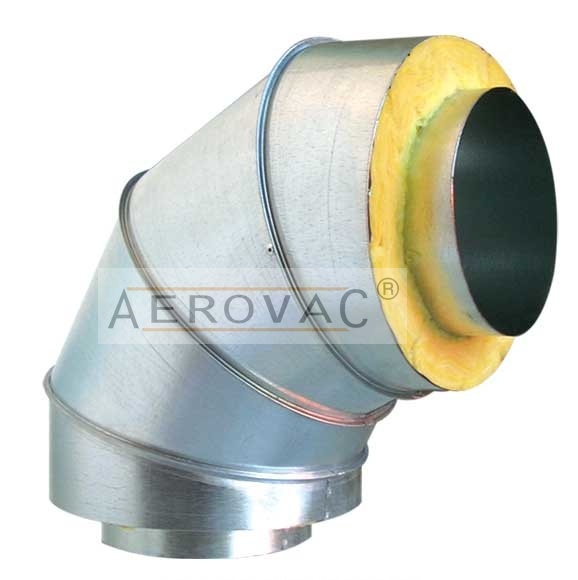 Duct fittings from AEROVAC Duct range in function, length, and diameter. If you are looking for flanges, elbows, branches, double branches or, y-branches we have many types of duct fittings in stock as well as custom fabrication capabilities. Many of our duct fittings are in the list below. Pressed and rolled steel flanges (angle rings) are used widely in joining ductwork together in dust and fume control work. All flanges/rings are of unpainted black steel. All sizes are stocked for immediate shipment. Flanged duct is available in 5' or 10' lengths. It is also available fully seam welded or in lock seamed joints. Lock-seamed is only available in 5' lengths. Standard flanges are galvanized. Available in stainless steel or black iron. Standard radius (1.5) and long radius (2.5) flanged elbows are available in 30 to 90-degree elbows; from 24 to 48 in diameter; and 16 and 18 gauge stainless or galvanized steel. The non-welded, unidirectional, pleated and flanged elbow is very cost efficient in systems where a small amount of leakage is acceptable (the wood industry). Available in galvanized steel only. 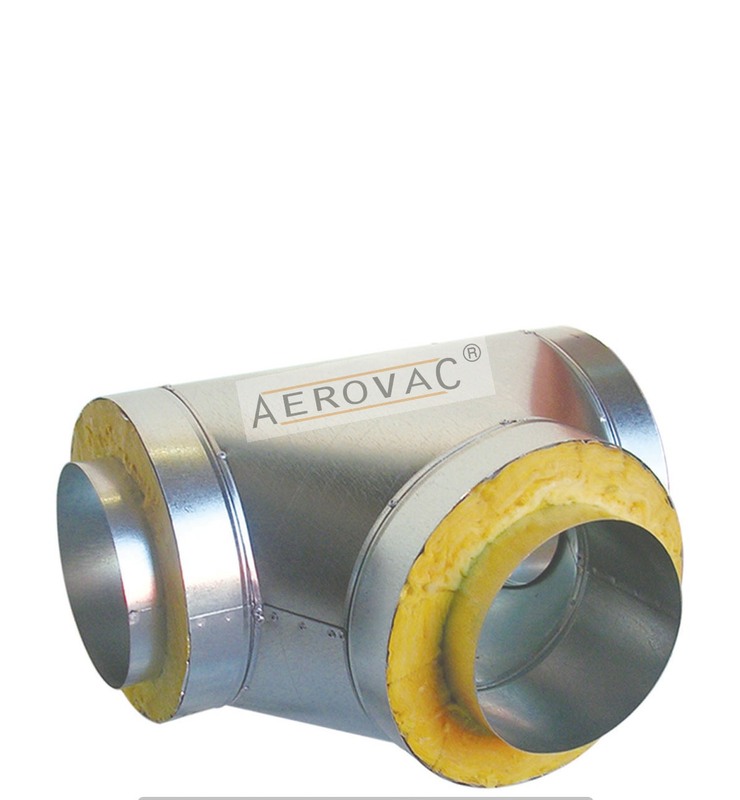 The welded, unidirectional, pleated and flanged elbow provides good, all around usage. Available in galvanized steel only. Single branches (Tee on Taper) are available in 30 and 45-degree angles; 24 to 48 diameter; and 18 to 16 gauge galvanized or stainless steel. Heavier gauges and larger sizes are also available. Double branches (Tee on Taper) are available in 30 and 45-degree angles; 24 to 48 diameter; and 18 to 16 gauge galvanized or stainless steel. Heavier gauges and larger sizes are also available. Flanged Y Branches are available in 30 and 45-degree angles; 24 to 48 diameter; and 18 to 16 gauge galvanized or stainless steel. Heavier gauges and larger sizes are also available. Flanged in-cuts are available with Tee's in 30 and 45-degree angles; 24 to 48 diameter; and 18 to 16 gauge galvanized or stainless steel. Heavier gauges and larger sizes are also available. Flanged cut-offs and Blast Gates are available in 4 to 22 diameters in both galvanized and stainless steel. Blast gates are constructed from 14 gauge galvanized or stainless steel. 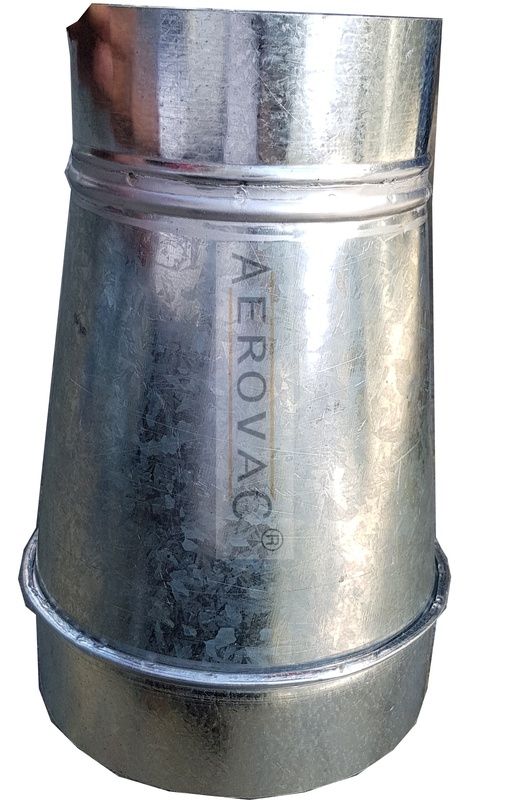 Flanged reducers are available in 24 to 48 diameters (priced by the large end) in 18 and 16 gauge galvanized or stainless steel. Available in heavier gauges and larger sizes. Flanged Rectangular to Round transitions (hemmed) are available in 24 to 48 diameters (priced by the large end) in 18 and 16 gauge galvanized or stainless steel. Available in heavier gauges and larger sizes. Casing 0.9/1.0 mm ( 20 gauge) thick Galvanized Steel Sheet. Blade: 1.2mm (18 gauge) thick Galvanized Steel Sheet. Round Shaft Bar of 12mm Galvanized Steel. Internal Acoustic Insulation of 12mm thick, 24kg/m3 acoustic liners made of fiberglass with Black tissue-facing. Differential Pressure Grid made of Aluminium is fixed at the Inlet Side of CAV. All VAV-s are mechanically sealed and gasketed for airtight construction. Modulating Type of Actuators, with 24Vac operating voltage will be installed with Digital Thermostat as a standard supply. DDC, BMS & Bacnet will be supplied upon clients request and optional. Sound Attenuators is installed for sound absorption with 600mm Lenght as standard supply. All Variable Air Volume are internally lined, sealed and manufactured as per international standards and confirmed to NFPA 90 A and UL 181 standards for erosion.